Boycott –verb (used with object) 1. to combine in abstaining from, or preventing dealings with, as a means of intimidation or coercion: to boycott a store. 2. to abstain from buying or using: to boycott foreign products. 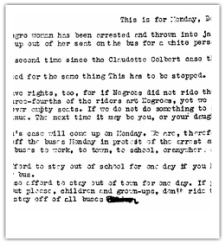 This picture is an actual letter sent to African Americans stating not to ride the buses! Rosa Parks used the protest method called a boycott. That means she asked all African Americans not to use any buses in Montgomery, Alabama. The boycott officially started on December 1, 1955. It was a 13 month mass, that was hard for everyone. Most everyone used the bus because it was easy transportation. They started car-pools, walking, and hitchhiking. None of the African Americans rode the bus for the period of 13 months.